Spring means renewal. Over this past month, as the sun starts to shine more on Standing Rock, we’ve taken many crucial steps toward a new way of thinking and living on the rez. Each day, we get closer to using the mighty power of our sun, and the sweeping winds across our plains, to establish our energy independence. Your support (nearly 20,000 people have now signed our petition to #GreenTheRez!) has helped propel forward our effort to bring renewables to Standing Rock. Led by my colleague, Phyllis Young, in cooperation with our tribal leadership, this effort has vast potential to benefit not just those of us who live here, but the earth we share. The Standing Rock Tribal Council has now endorsed this work, and our tribal and school board chairman, Mike Faith, has signaled his support to retrofit the rez’s schools. We’re also in talks with the general manager of Grand River Casino, and we will do an assessment there soon. It’s not an overstatement to say that the potential carbon savings from Standing Rock’s two casinos is massive. That’s not all. As Phyllis and I mention in our new video, we’ve accomplished energy efficiency and solar assessments in the four largest of Standing Rock’s eight districts, and we’ve also assessed the tribal headquarters, where we have a plan to cut energy use by 75%. Phyllis has been a model of activism for 40 years, and I’m honored to be working in concert with her to make all this happen. Her $10,000 fellowship from MIT Solve to green the rez brings with it invaluable support. As I write you today, Phyllis has traveled to MIT, where she’s conferencing with dozens of political, technological, philanthropic, and industrial luminaries. 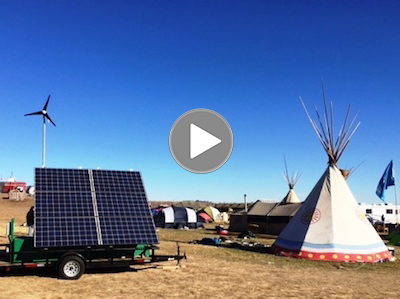 In August, MIT will join us again at Standing Rock for our second renewable energy summit. We aren’t slowing down! I can’t thank you enough for your participation and generosity. It’s been and will continue to be a year of change. As my trial draws nearer, my heart is lifted knowing that both my landmark defense and our efforts to make Standing Rock renewable will create lasting, positive impacts for my relatives and for all people. Pilamaya — My sincere thanks to you for your advocacy and compassion!